Targeted for release by June is the Cupertino-based company's second LED-backlit Cinema Display, measuring 27-inch diagonal and largely resembling a slightly magnified version of its existing 24-inch model (review), which was introduced to much fanfare back in October of 2008. Two people familiar with the upcoming display say its been lingering in Apple's labs for quite sometime, where it's frequently referenced by the unique identifier/codename "K59." The Mac maker is believed to have been waiting patiently for the cost of the larger LCD panels, which sport a resolution of 2560 by 1440 pixels, to shed some of their premium before introducing the model to market. Thanks to the success of its 27-inch iMacs, which sport similar components, Apple's now believed to be in a position to market the display more affordably. The company also recently put behind it problems with the same size panels that slowed the momentum of its larger iMac offerings for several months following their October 2009 introduction. Meanwhile, Apple is also wrapping up development of its brawniest update to the Mac Pro ever, also slated to arrive by June, despite external reports that inaccurately pegged its release to show up as early as January or as recently as this week. While details are scarce, people familiar with the matter were stern in stating that Mac maker's plans call for a dodeca-core model, sporting a pair of Intel's latest Westmere-based hexacore chips for a total of 12 cores. 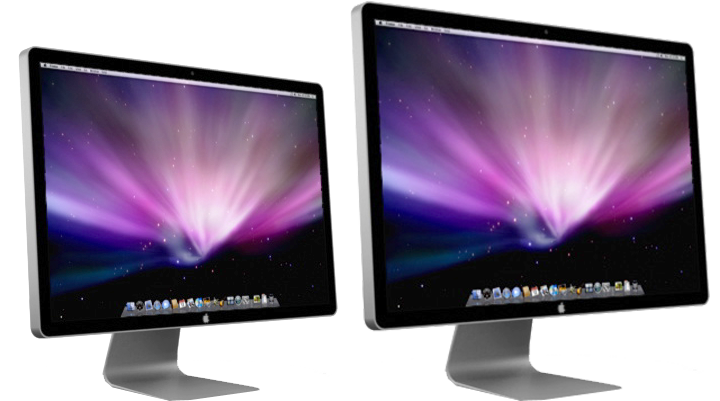 Mockup of Apple's existing 24-inch LED display next to its upcoming 27-inch model. Though AppleInsider is still awaiting confirmation, it's suggested that Apple will likely stick to its existing Xeon strategy, employing a pair of pricey Xeon 5600 Series "Gulftown" chips into a wallet-crunching dodeca-core Mac Pro, while offering a single processor model with 6 cores at prices similar to today's $2,500 quad-core model. The 5600 series will be available within the next 45 days in 2.66, 2.8, 2.93, and 3.33GHz configurations, ranging in price from $996 to $1663 in lots of 1000. These new 32 nanometer chips have 12MB of L3 cache, and 6 cores with 12 threads for each CPU. Apple typically bundles the most affordable of these pricey multi-core chips into its standard dual-processor model, offering the higher frequency chips as build-to-order options. Still, there have been persistent rumors (1, 2, 3) that Apple would abandon its Xeon strategy and adopt two of Intel's $999 3.33GHz Core i7-980X Extreme Edition uniprocessor chips for a 12-core Mac Pro. However, Intel clearly lists this chip as uniprocessor model, meaning the Mac maker would need to adopt a dual motherboard strategy to make that happen. 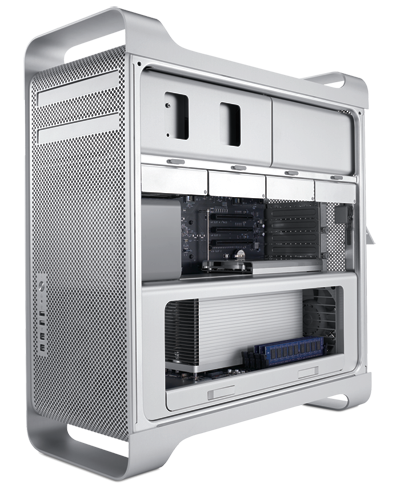 Outside of potential for cost cutting, the benefits of such a strategy aren't particularly apparent given the low volumes Apple sees in regards to Mac Pro sales.